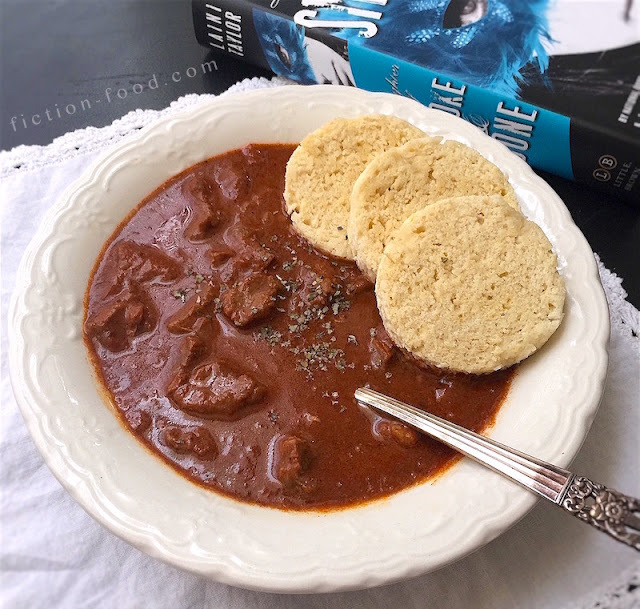 As mentioned in my previous post for cream horns from Laini Taylor's Daughter of Smoke & Bone, here's the promised goulash! It's been raining all month here so goulash seemed like a good fit. The main setting for DoSaB is Prague, which is the capitol of the Czech Republic where goulash is a super common and hearty dish found in pretty much every restaurant and pub. 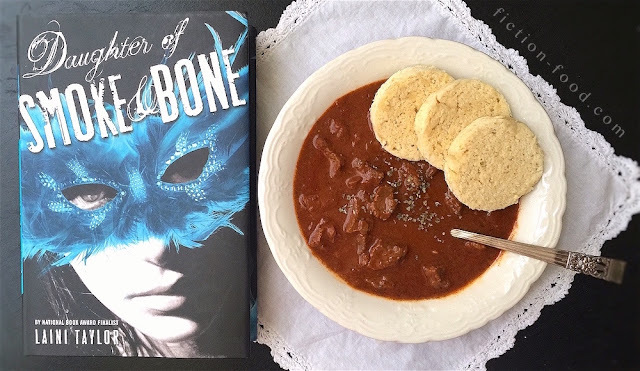 In the novel, the main character Karou and her best friend Zuzana often enjoy goulash at a special hangout called "Poison Kitchen". The café, accessible through an ancient graveyard, was converted from monk's quarters previously attached to a church that burned down some 300 years prior. The story goes that one monk went insane and killed his companions by poisoning their goulash; hence the café's name. It's decorated with real skulls, old statues, coffins as tables, and WWI gas masks. Two years before the novel begins, Karou and Zuzana, both new art students at the time, were asked to paint skeletons on toilets in the bathroom. They were paid in suppers for a month, and were regulars ever since. "Fine. Okay. I'm dying for some goulash. Get it? Dying. Ha ha." Goulash originated in Hungary (it's Hungary's national dish) and is very common in other European countries (my dad loves German goulash). 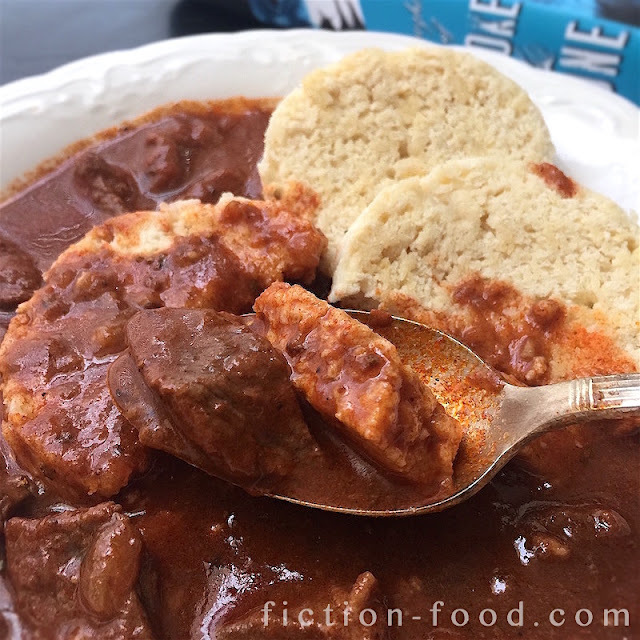 Czech goulash is typically made with beef and served with boiled bread dumplings called knedliky (recipe below) and garnished with chopped onion–which I totally forgot to put on before I took pictures :(! Some recipes call for bell peppers and carrots and tomato paste, etc., but I wanted to keep this recipe very basic and traditional. 1. In a large pot over medium heat, heat the oil & chopped onions until the onions are tender & beginning to brown. Remove from heat & add in the paprika, caraway, marjoram, salt, & pepper & stir until thoroughly mixed. Next, add the beef cubes & stir again to coat. Return the pot to medium heat & add the water & stir. Bring to a boil & then lower the heat to a simmer. Cover, but leave a small opening so some of the steam can escape, & cook for about 1 hr. 1. In a large bowl whisk together the flour, baking powder, & salt. Make a well in the center & pour in the milk & beaten egg & stir to combine. Add in the bread cubes & stir until smooth. Spread a little Wondra flour on a flat work surface & roll the dough into 2 seperate logs (able to fit in a large pot). 2. Let the dough rest & bring a large pot about 3/4 full of water to a boil. Stir in about 1 tsp. of salt & then float 1 of the dough logs in the water. Cook for 10 minutes & then flip & cook for 10 minutes more. Remove from the water & pat off on a paper towel. Cut into 1/2" thick slices by sliding plain dental floss under the bread & crossing over & pulling the ends to cut. Repeat the cooking & slicing with the other dough log. Serve the sliced knedliky with your beef goulash! Could you do something from "Maus" by Art Spiegelman, pleeeeeeease? I know, it's not YA nor is it MG, it's a graphic novel, but it's amazing. Please? I'm 17 years old...I read it for school. Could you do it and break your rule of sticking to YA and MG? I think you would like it a lot.